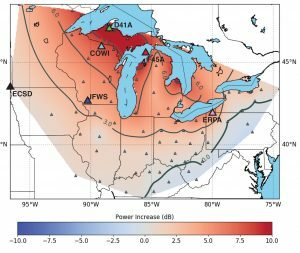 15 May 2018–Record cold temperatures during the winter of 2014 in the Midwestern United States froze large parts of the Great Lakes—and inadvertently offered seismologists a chance to learn more about the seismic signals created by the lakes’ wind-driven waves. The deep freeze stilled the waves and created a period of seismic “silence” that U.S. Geological Survey seismologist Rob Anthony and others compared to previous and subsequent unfrozen years to uncover the lakes’ unique seismic signals, called lake microseisms. These seismic signals could be detected as far as 300 kilometers away from the Lakes, he noted, south to Kentucky and as far west as parts of the Dakotas. Now that these lake microseisms can be identified and measured, operators of seismic networks can take steps to mitigate the impact these signals may have on the detection of earthquakes, Anthony said. But they may also prove useful in helping to image the Earth’s subsurface, and in monitoring shoreline erosion, he noted in a talk at the 2018 SSA Annual Meeting. Oceans produce seismic signatures—generated from waves hitting the shore and from interacting with other waves which create pressure variations in the water column which pump the ocean floor—that have been used by seismologists to study similar phenomena. “In the absence of earthquakes, if you look at the background signature of seismic activity happening anywhere on Earth, the largest seismic signals arise from ocean waves,” said Anthony, who began looking for similar signals generated by large lakes. The freeze coincided with a time of dense seismic station coverage in the region, courtesy of the U.S. Transportable Array of temporary seismic stations, which made it easier to pinpoint changes in the lake’s seismic signature. Like ocean microseisms, lake microseisms can be used as a sort of “CAT scan” to visualize the Earth’s subsurface structure. “And the shorter period of this lake signal compared to an ocean microseism, which is usually used in ambient seismic imaging, could give you higher-resolution images,” said Anthony. Another higher frequency signal detected by the researchers, coming at about .2 seconds, may be tracking waves hitting the lake shore. If confirmed, these signals could be useful in tracking shore erosion over time, Anthony said. He and his colleagues are continuing to study lake microseisms in places like Canada where large lakes may offer similar opportunities to compare frozen and non-frozen periods. They think that wind coupling with the surface of the lake to make waves produces the one-to-two second peak, but they hope to learn more about the exact physical mechanisms behind the signal. The research team published a paper in March in Geophysical Research Letters that discusses the Great Lake results.